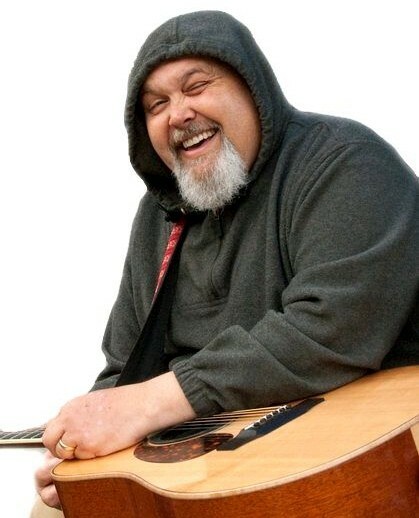 Marques Bovre, singer, guitarist, composer, artist-in-residence at Lake Edge United Church of Christ’s “Worship at the Edge,” died this week at the age of 50. There have been numerous fundraisers to help pay for his cancer treatments over the past year or so, which brings me back to the fundamental question: Why should ANYONE have to have fundraisers to pay for CEOs to have private planes and yacht trips to Bermuda? Health care is a right. Now, Marques would be the first to say he was no better than anyone else in this world (in fact, on his last CD, “Nashville Dandelion,” there was one song called, “On The Body Of Christ, I Am The A**hole.” That’s his wry sense of humor, and we loved him for it). Please visit Marques’ site HERE. There are his songs, his story. He never proselytized, and yet a more fervent believer I never knew. If you like what you hear, BUY SOME MUSIC. Tracy still has medical bills to cover, in the midst of her grief. It will mean a lot to the whole family, and to me. So very sad to lose such an inspiring soul…so sorry for your loss…but his music will live on… I do agree health care is a right… take care! sounds like an interesting dude. sorry that he passed. Thank you for sharing Marques with us , Amy. love and hugs for you and all there that are grieving and missing him. I’m so sorry for your loss, but what a wonderful tribute you have here, Amy. Such a beautiful piece that shares this wonderful person in verse. Your elegy shows a man loved, a man worthy, a community loss. Beautifully done. Such a moving tribute to one so inspiring. Those with so much to contribute are sadly the victim of circumstances. Nicely Amy! Very moving, Amy, thank you for putting it into such eloquent words. We should all toast his life with some dandelion wine. Oh Amy, what a man! Lion-hearted and joyous and deeply humble. Such a loss. Your words remember him well and thankfully he has cd’s so his music will live on. Yes, health care is a right. His light went out way too soon. I am so sorry Amy–I am so moved by this write Amy! Powerful and moving tribute, Amy! Wow seems like a great man who will be missed. I love when you find gems like these, real people with a real presence and presence of mind. So sorry for the loss. Great write. So true, Amy. You CAN prepare for someone dying (or think that you are preparing for that), but you really cannot prepare for having that person suddenly dead. There are some losses we are never ready for. This man, for you, seems to be one of those. I am glad you wrote this poem to commemorate him & also to share him with others who did not know him! A very touching tribute to a man who touched so many. You were fortunate your paths crossed. You really had feelings for this young man–only 50??? I’m sorry you are sad, My condolences to you and others.We can prepare for death, but cannot prepare BEING dead. A gem of thought there. It is the one place we each and every one–go by ourselves Alone, but hopefully–NOT lonely! Wonderful poem and lovely tribute to your friend. My sympathies for your loss. Ah. Very sad. Terrible disease. K.
What a lovely tribute to your friend and fellow bard. People like your Marques have the inner light shining thru them and the chosen can see it and you captured it perfectly. You have written a fine epithet. surely, he is smiling on the other side. This touching tribute pierces my heart. Thank you for introducing him to us.